I knew it would happen at some point. Every square inch of our home is now filled with baby stuff. And to think I was stressing over getting the carpets cleaned before baby arrived. Ha! The plus side to having our tiny home over-run with sproglett related paraphernalia is that you can no longer see the carpet that once needed a good clean. Manoeuvring around our home has become some sort of obstacle course. If you make it from one room to the other without tripping over a bouncer or stubbing your toe on the car seat then you’re more ‘on form’ than you think you are, which of course is very rare these days. I swear our baby has more thrones than the Queen. But there’s no denying that everything has it’s sanity-saving uses. The bouncer keeps her quiet whilst we cook dinner and the bean bag cushions her on those rare occasions when she has a cat nap. There’s also a huge cushioned mat for tummy time, that we use for all of two minutes a day before she screams the place down. Oh the fun we have. But more recently, the last remaining bit of floor space has been occupied by a newborn to toddler gym which is coming in handy as she begins to enjoy some play time. 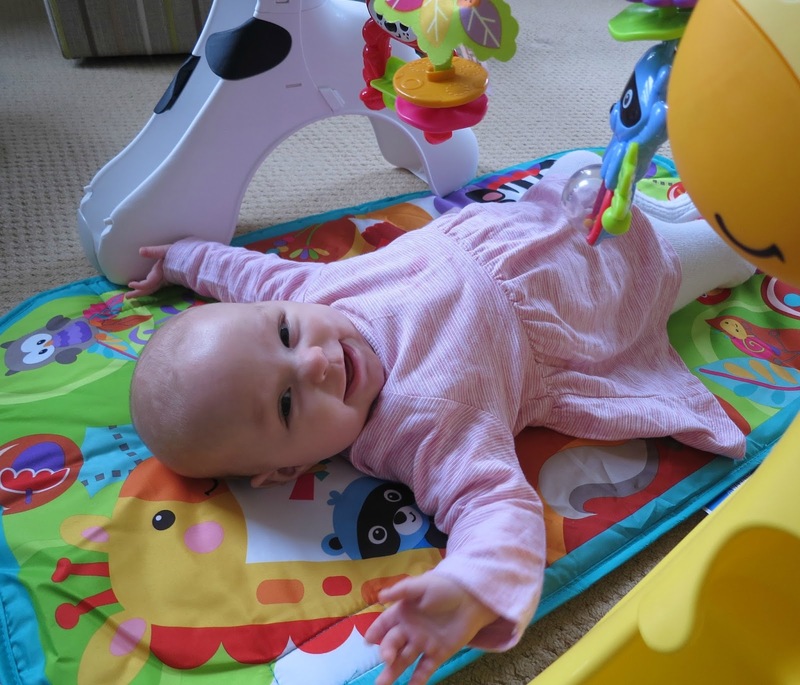 The play mat, from Fisher-Price, is an interactive activity arch designed to entertain and encourage baby’s sensory skills as they grow from laying, to sitting then standing. It features over 12 activities including toys, music, sounds and lights and costs between £50-70 online. It’s bright. 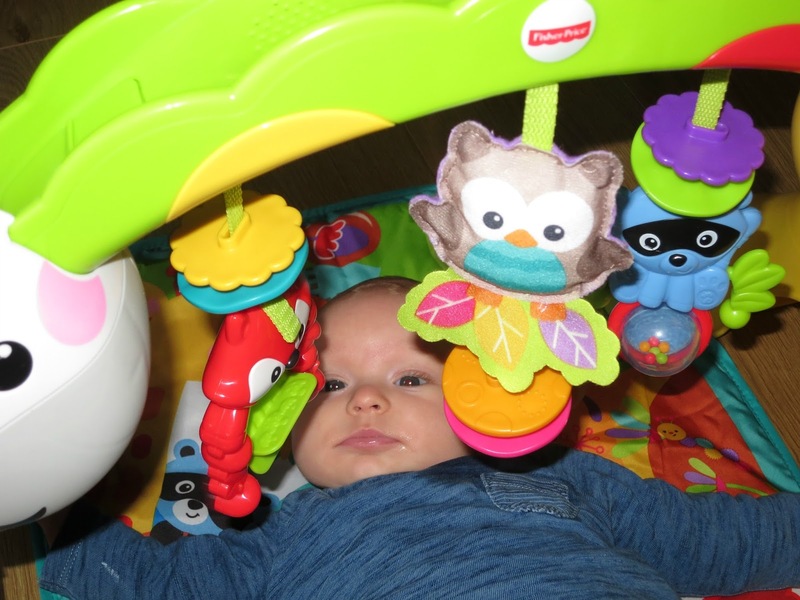 Up until the play gym arrived, I’d been a bit of a grouch when it came to any sort of garishly coloured toys, opting for neutral themes that of course I realise now, are pretty pointless to a baby whose eyes are only stimulated by bright colours and patterns. Elsie was immediately mesmerised by the yellow giraffe and black and white zebra on each side of the gym. Goodbye neutral tones, hello primary colours. It’s interactive. 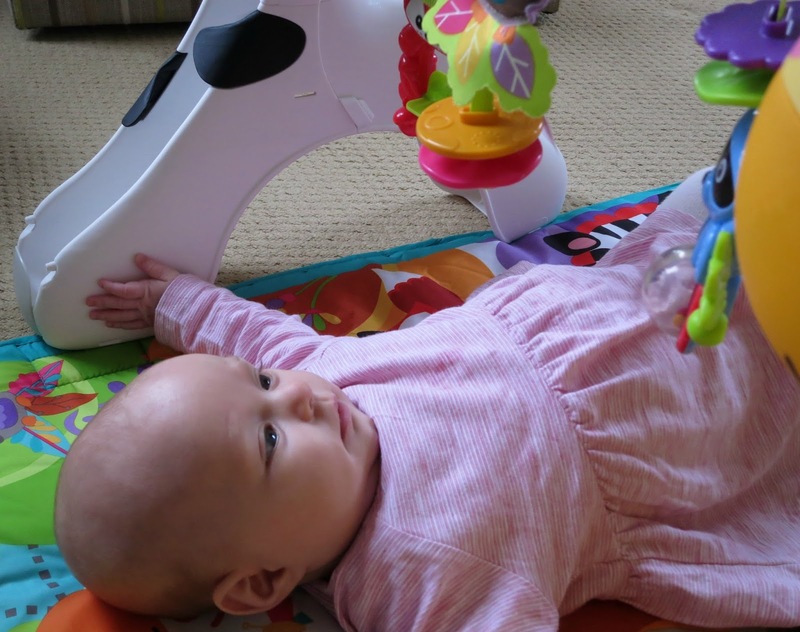 At three months old, Elsie has found her arms and is making full use of her new skills as an amateur boxer. I love watching her swing those cute little arms with full force at Mr Raccoon and Foxy (Mrs Owl is a little too high at the moment- but she’ll no doubt be getting a right old conk not before long!) It’s great seeing her big beautiful eyes widen when she hits her target which then makes a sound. Elsie 10- Mr Racoon 0. Probably the loveliest aspect of this gym is being able to see how her senses and motor skills will develop around this gym. She is changing so quickly and learning new skills everyday, I know it won’t be long before we’re teaching her to roll the play balls across the arch and down the giraffe’s legs! It’s light. So light in fact it’s easy to transport from home to the grandparents. The play mat itself is easily detachable (and washable) and has little pockets to store the play balls in. The swinging crew can even be detached so as soon as Elsie shows signs of grabbing a particular animal we can detach it for her to slobber all over. There are only a couple of downsides to the play gym. Firstly (and most importantly) is that it didn’t include batteries, so we missed out on all extra music, sounds and lights for quite a few weeks before I actually got around to purchasing AAA batteries (who has a secret supply of those pokey little batteries to hand?) Secondly the price of the product might also put off new parents or deter the average person, but on the plus side the gym is designed to last a few years. It grows with your child providing new aspects of entertainment as they develop, so it is a good little investment and would make for a perfect gift, even if family and friends chipped in together. If you’re looking for something that is original, fun, interactive with more longevity than all the clothes they burst out of before your very eyes, then as a new mummy, this baby gym is definitely worth the floor space. Just remember to get the batteries. 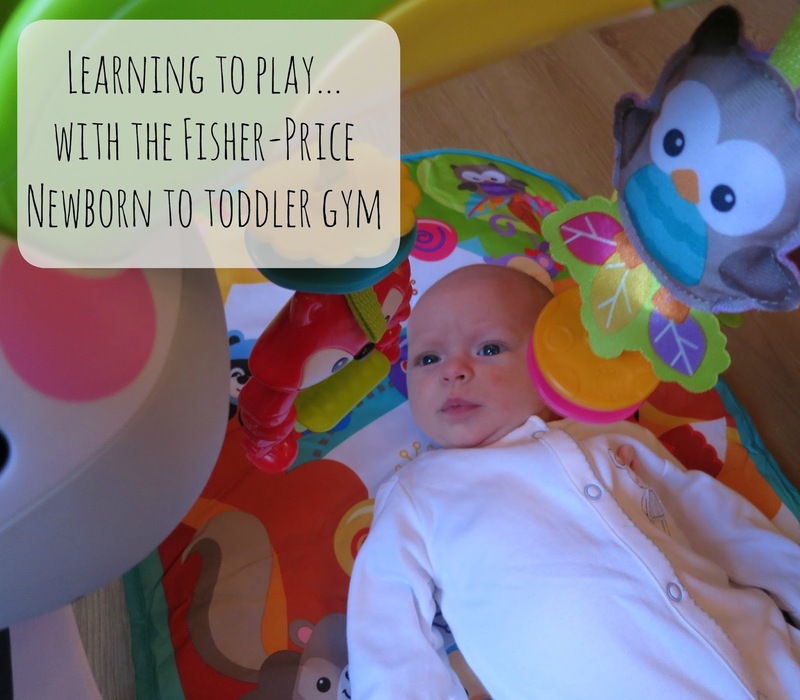 Disclosure: We were kindly sent the Fisher Price Newborn to Toddler Play Gym to review. As always all opinions are my own and have not been influenced in any way. Thank you for supporting the brands that make this blog possible.